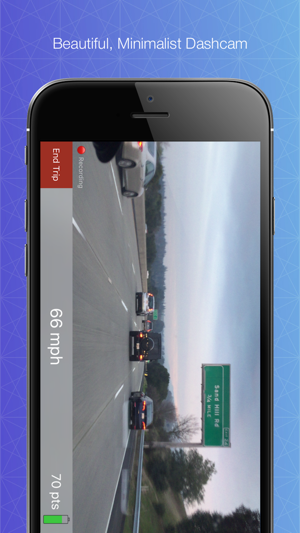 Payver is the dashcam that helps autonomous vehicles and your city. When you drive with Payver, you have dashcam evidence for collisions or interesting events on the road. Payver also uses deep learning to detect potholes on the road and automatically report them to your city. Over time, we hope to make the roads better for everyone. Keep proof of dangerous incidents on the road -- you'll thank yourself if you ever need the evidence later in court. Someone cuts you off? Get an unjust ticket? Accident? Stay in control - Payver gives you the choice to keep the data. Payver automatically triggers a 30 second snapshot when it detects hard braking events. 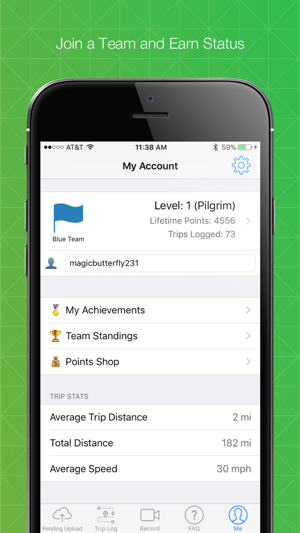 Keep track of where you've been and earn badges for certain achievements like visiting a National Park. We create beautiful time lapse videos of your trips so you can see your entire drive in 30 seconds. 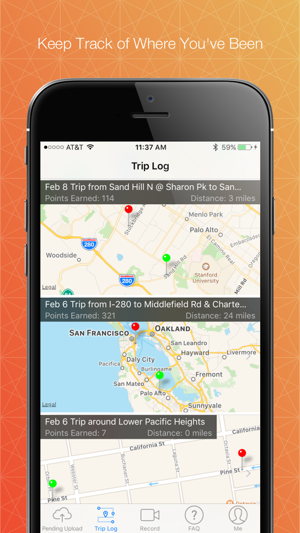 By using Payver, you're also helping keep road maps up-to-date. We use the data to find problems with roads and alert the right government authorities. We automatically look for potholes, fallen signs, and construction zones from the video you capture. Payver needs access to your location and camera to function properly. >5mbps upload speed recommended. Great app for truck drivers, cabbies, rideshare drivers or anyone who’s on the road a lot during the day. I’ve made $60 in gift cards in the last 45 Days of using the app. But it has its issues. A bubble meter showing correct placement of the cam instead of a bad visual of the road ahead would be better. A better layout for the control buttons in horizontal mode; since the phone needs to be horizontal and most phone holders hold the phone by its side, when in horizontal mode, you can’t really tap the record button easily. You have to start recording and then adjust quickly before the visual pop up fades away. Very dangerous the way it is now. Record button should be on top left when in horizontal portrait mode. A better UI in the uploads screen as well and fix the super slow upload speed. A 4mile trip of 1.1gb upload while on a 100mb Wi-Fi connection took almost 30 minutes-way too long. The best app ever!!! I would recommend this app to anyone who drives!!! I have to commute long distances on a daily basis!!! I purchased a $1.99 gps/phone holder at my local Roses’ store and I’ve been racking up the points ever since!!! 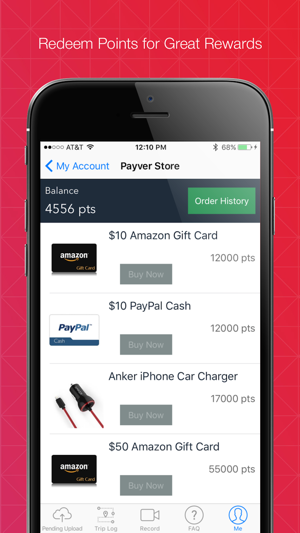 Payver has an awesome point system and the points add up very, very quickly which means more $$$$$$!!! It does take quite a while to sync your journeys, but just make sure that you sync after each drive and that you have excellent WiFi service, that will speed up the process a whole lot faster!!! This is easy and free money for something that you already do with no effort, so why not download this app!!! I promise that you will not regret it!!! Thank you Payver, keep up the great work!!! All of this conveniently started happening as I approached enough points to get $100. Nothing is working right. My trips aren't showing the correct length. I'm driving 250 miles, minimum, and only getting 50 on the trip screen. As I'm driving I'm only getting 2-3 points per mile. When it does work correctly, the app closes all of the sudden after about 5 miles. Then when I upload it only gives me about 25% of my points, when I use to get at least 50% after the video was evaluated. Now, when my points update on the account screen, they don't match what the trip said I earned when it finished uploading. It's only giving me half of that number. I'm not getting credit for thousands of points per day. This has been going on for a week now. I've deleted and reinstalled several times. I've sent numerous messages and have had no response. Someone answer me!!! I'm really sorry about the delay in responding! I took a bit of an extended Thanksgiving break, and as a result, some of the support threads went unanswered for a little bit. We're not trying to cheat you by any means. Actually, I noticed that you're using an outdated version of the app. You are using a device which is on iOS 10, which is no longer supported by Payver. If you update your OS, you should receive all the latest updates from the team and these issues will go away. Thanks for understanding! And sorry about the confusion.